I am so happy to be a part of Jenna's week of giveaways! My name is Beth and I have been using Young Living essential oils since March 2014. I started researching (a TON!!) about them back in the Fall of 2013, but didn’t jump in with both feet until March...and my only complaint is that we didn't start using them sooner! We finally decided to try them after our oldest daughter had been continually sick with a cough, runny nose, etc once she started Kindergarten. The final straw was her being diagnosed with pneumonia in early March and ending up in the hospital – I knew then that we had to take our family’s health into our own hands! Since then, the oils have become a huge part of our life and we use them daily in our home, travel with them, and love telling others about just how amazing they are (even our girls will ask for/suggest an oil on their own now!). My girls both suffer from seasonal allergies, upset tummies, scrapes, coughs, runny noses, moodiness, etc; my husband has allergies, asthma, and reflux; and I, also, have seasonal allergies, suffer from migraine headaches, neck/shoulder pain, etc. Young Living Essential Oils have replaced almost all OTC meds in our home, and decreased my chiropractor visits (one visit in 6 months instead of twice a month)! Would you like to spend a lot less at the drugstore and doctor visits??? It is possible – My family is proof, as well as many other Young Living Essential Oil members. It is great to have that money to put to better use - like a family night out, save up for vacations, pay off debt or ________???? How would you fill in that blank? 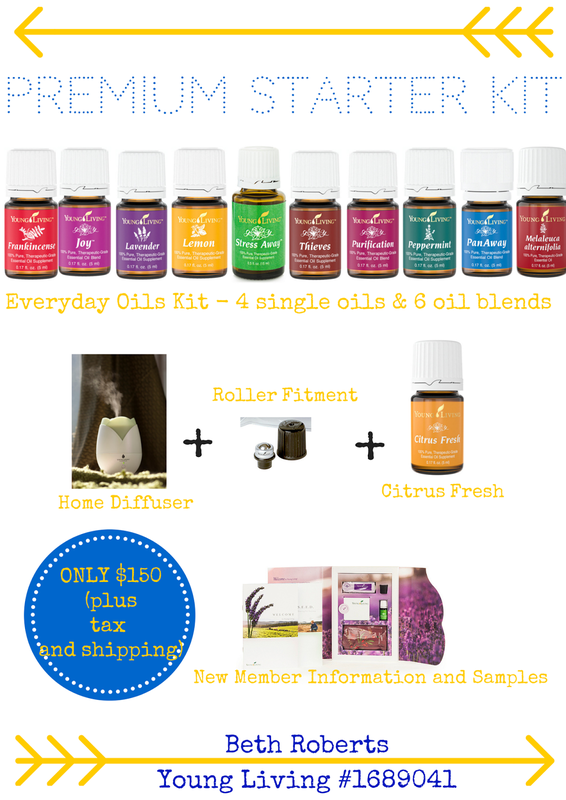 The Premium Starter Kit is Young Living's most popular starter kit, because it includes their 10 Everyday Oils, a Home Diffuser (a MUST have!! ), a bottle of Citrus Fresh, a roller ball fitment, as well as some great samples and new member information. This is a TON of product and definitely the most "Bang for your Buck"! 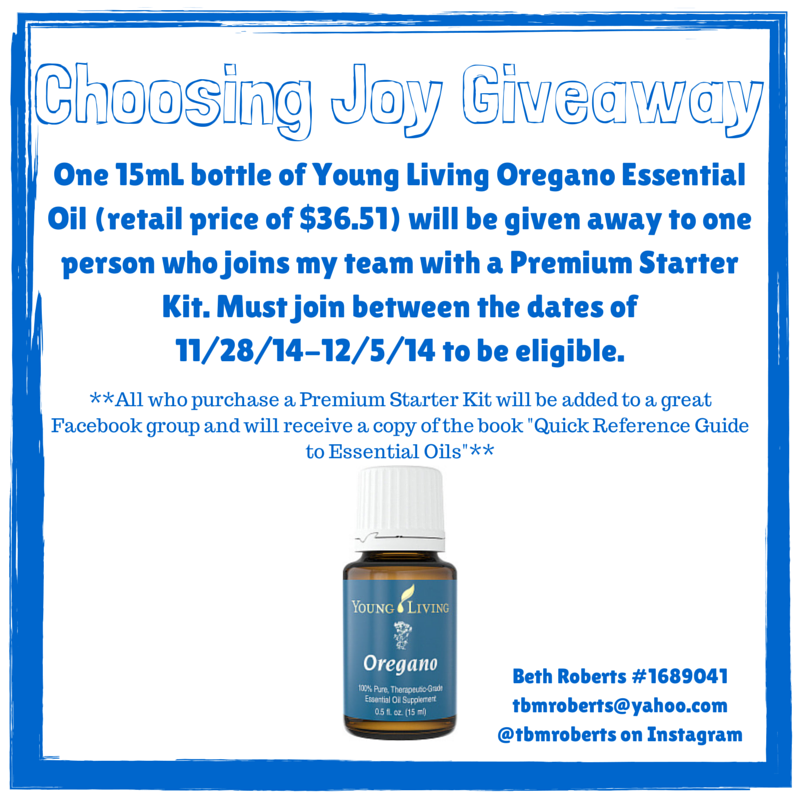 The first giveaway is a 15mL bottle of Young Living Oregano Essential Oil. Oregano (Origanum vulgare) is one of the most powerful and versatile essential oils. It contains strong immune-enhancing and antioxidant properties and supports the respiratory system. Oregano may also be used to enhance the flavor of food. To be entered to win the Oregano, purchase a Premium Starter Kit from me between the dates shown above. All new members who purchase a Premium Starter Kit from me will receive a great reference guide, and will also be added to an amazing Facebook group that is full of helpful information. The second giveaway is a 5mL bottle of Christmas Spirit. Christmas Spirit is a sweet, spicy blend of orange, cinnamon, and spruce essential oils that tap into the happiness, joy, and security associated with the holiday season. With Christmas Spirit on hand, simply open a bottle and start diffusing! Diffuse or sprinkle on logs in the fireplace, on Christmas trees, on cedar chips for dresser drawers, or on potpourri. Use all year round. 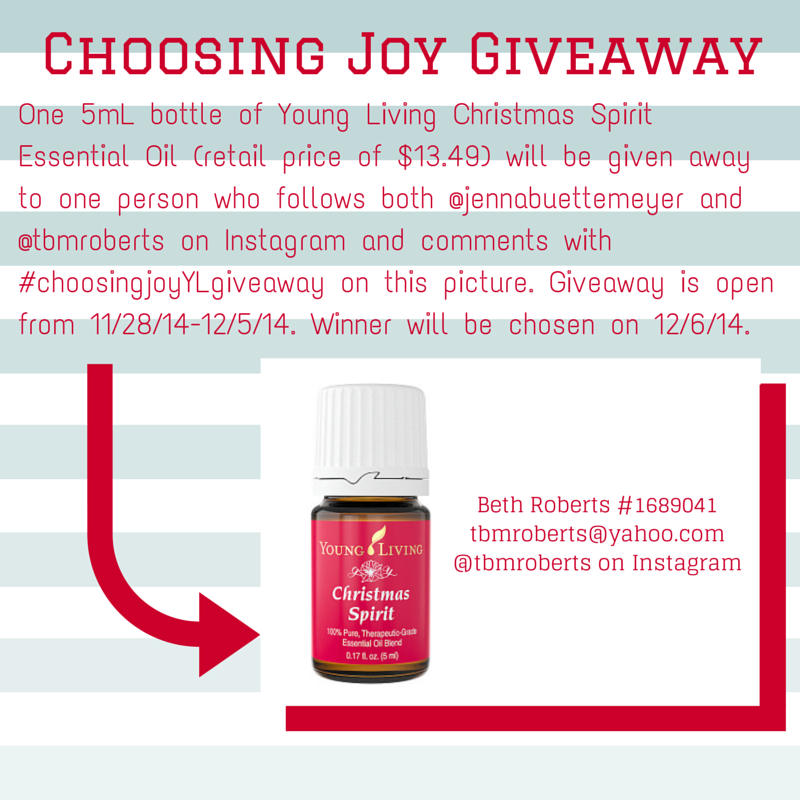 To be entered to win the Christmas Spirit, be sure to follow @jennabuettemeyer AND @tbmroberts on Instagram by 12/5/14. You can also repost on your personal instagram with #choosingjoyYLgiveaway for extra entries. Please be sure to enter via the Rafflecopter below! There is a great business opportunity with Young Living Essential Oils, as well. If that's something you might be interested in, get in touch with me! Please feel free to email Beth with any questions you might have!